Thanks to their naturally independent natures, cats are fairly low maintenance pets that can typically don’t require as much training as their canine counterparts. That said, our cats still depend on us for food, shelter and company, so it’s important to do our best to give them the care they need to live happy, healthy lives. We can start by trying to avoid these common cat care mistakes. Obesity isn’t just a health concern for humans. According to the Association for Pet Obesity Prevention (APOP), more than 50 percent of U.S. cats are overweight or obese. Try to keep your cat on a regular feeding schedule, and resist the urge to give them treats every time they beg for extra food. If you notice your cat is starting to get a little chubby, adjust their diet accordingly to keep them at a healthy weight. If you continue to have trouble controlling your cat’s weight, consult your vet for suggestions on how to avoid excess weight gain. Cleaning the litterbox isn’t exactly the most glamorous aspect of cat ownership, but it’s certainly a necessary one. A dirty litterbox can not only make your cat uncomfortable, but also increase the likelihood that they will start using inappropriate places like beds and carpets as their bathroom instead. Cleaning out your cat’s litterbox is also a good opportunity to check for signs of diarrhea and other digestive health issues. The good news is, there are plenty of products on the market today that make litter box cleaning quick and easy. 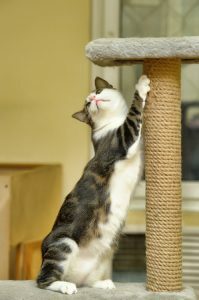 It can be tempting to give your cat a stern scolding when they scratch a piece of furniture or make a mess on the floor, but this response can often be counterproductive and detrimental to your relationship with your cat. Cats don’t understand this type of punishment, and it can often cause them to become stressed and fearful without resolving underlying behavioral issues. Instead of punishing your cat when they behave badly, try to distract them with a more acceptable alternative behavior. If your cat is playing with the Ethernet cable on your computer, for example, give them an appropriate toy to play with instead of yelling at them and swatting them away.